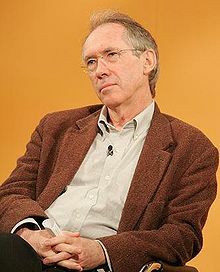 Ian McEwan (born June 21, 1948) is a British novelist. Ian McEwan: I guess my starting point would be: the brain is responsible for consciousness, and we can be reasonably sure that when that brain ceases to be, when it falls apart and decomposes, that will be the end of us. From that quite a lot of things follow, especially morally. We are the very privileged owners of a brief spark of consciousness, and we therefore have which one can work towards and maybe make sacrifices, and, crucially, make sacrifices of other people. We have a marvellous gift, and you see it develop in children, this ability to become aware that other people have minds just like your own and feelings that are just as important as your own, and this gift of empathy seems to me to be the building block of our moral system. Richard Dawkins: I profoundly agree with you, and I've always felt that one of the things that is wrong with religion is that it teaches us to be satisfied with answers which are not really answers at all. Ian McEwan: And if you have a sacred text that tells you how the world began or what the relationship is between this sky-god and you, it does curtail your curiosity, it cuts off a source of wonder. The loveliness of the world in its wondrousness is not apparent to me in Islam or Christianity and all the other major religions. from The Root of All Evil?, Channel 4 documentary, United Kingdom (January 2006). On the 9/11 hijackers: "Now, I'm an atheist. I really don't believe for a moment that our moral sense comes from a God. … It's human, universal, [it's] being able to think our way into the minds of others. As I said at the time, what those holy fools clearly lacked, or clearly were able to deny themselves, was the ability to enter into the minds of the people they were being so cruel to. Amongst their crimes, is, was, a failure of the imagination, of the moral imagination." (From "Faith and Doubt At Ground Zero," Frontline, February, 2002). We went to a club where singers and stand-up comedians performed in the hope of being discovered. A thin girl with bright red hair and sequined T-shirt reached the end of her passionately murmured song on a sudden shrill, impossible top note. All conversation ceased. Someone, perhaps maliciously, dropped a glass. Halfway through, the note became a warbling vibrato and the singer collapsed on the stage in an abject curtsy, arms held stiffly in front of her, fists clenched. Then she sprang to her tiptoes and held her arms high above her head with the palms flat as if to forestall the sporadic and indifferent applause. "They all want to be Barbra Streisand or Liza Minnelli," George explained as he sucked a giant cocktail through a pink plastic straw. "But no one's looking for that kind of stuff anymore." I did not kill my father, but I sometimes felt I had helped him on his way. He had once felt light on the ground. He used to think his life was an open-ended adventure, he used to give things away, it amused him when the unexpected happened, benevolent coincidences used to bear him along. When had all that stopped? You want a picture of futility? It's a tunnel in the desert, from nowhere to nowhere, four hundred and fifty feet long. Nearby, where the main road forked, stood an iron cross on a stone base. As the English couple watched, a mason was cutting in half a dozen fresh names. On the far side of the street, in the deep shadow of a doorway, a youngish woman in black was also watching. She was so pale they assumed at first she had some sort of wasting disease. She remained perfectly still, with one hand holding an edge of her headscarf so that it obscured her mouth. The mason seemed embarrassed and kept his back to her while he worked. After a quarter of an hour an old man in blue workman's clothes came shuffling along in carpet slippers and took her hand without a word and led her away. When the propriétaire came out he nodded at the other side of the street, at the empty space and murmured, 'Trois. Mari et deux frères,' as he set down their salads. This sombre incident remained with them as they struggled up the hill in the heat, heavy with lunch, towards the Bergerie de Tédenat. They stopped half way up in the shade of a stand of pines before a long stretch of open ground. Bernard was to remember this moment for the rest of his life. As they drank from their water bottles he was struck by the recently concluded war not as a historical, geopolitical fact but as a multiplicity, a near-infinity of private sorrows, as a boundless grief minutely subdivided without diminishment among individuals who covered the continent like dust, like spores whose separate identities would remain unknown, and whose totality showed more sadness than anyone could ever begin to comprehend; a weight borne in silence by hundreds of thousands, millions, like the woman in black for a husband and two brothers, each grief a particular, intricate, keening love story that might have been otherwise. It seemed as though he had never thought about the war before, not about its cost. He had been so busy with the details of his work, of doing it well, and his widest view had been of war aims, of winning, of statistical deaths, statistical destruction, and of post-war reconstruction. For the first time he sensed the scale of the catastrophe in terms of feeling; all those unique and solitary deaths, all that consequent sorrow, unique and solitary too, which had no place in conferences, headlines, history, and which had quietly retired to houses, kitchens, unshared beds, and anguished memories. This came upon Bernard by a pine tree in the Languedoc in 1946 not as an observation he could share with June but as a deep apprehension, a recognition of a truth that dismayed him into silence and, later, a question: what possible good could come of a Europe covered in this dust, these spores, when forgetting would be inhuman and dangerous, and remembering a constant torture? Who you get, and how it works out - there's so much luck involved, as well as the million branching consequences of your unconscious choice of mate, that no one and no amount of talking can untangle it if it turns out unhappily. On a recent Sunday evening, Theo came up with an aphorism: the bigger you think, the crappier it looks. Asked to explain he said, "When we go on about the big things, the political situation, global warming, world poverty, it all looks really terrible, with nothing getting better, nothing to look forward to. But when I think small, closer in – you know, a girl I've just met, or this song we're going to do with Chas, or snowboarding next month, then it looks great. So this is going to be my motto – think small." This is how the entire course of a life can be changed - by doing nothing. Nations are never virtuous, though they might sometimes think they are. How can one understand the inner life of a character, real or fictional, without knowing the state of her finances? Quoted at the front of the book.